Mr and Mrs Gordon Woolcombe were newlyweds. They had only been married a few days when the Singapore Mutiny broke out. Unaware of events as they were unfolding Mr and Mrs Woolcombe were driving along the Pasir Panjang road. Stopped by sepoys they were likely asked if they were “Inglees” and answered “Yes”. The sepoys then fired at Gordon. It is thought that Mrs Woolcombe died trying to protect her husband as her body was found lying across the body of her husband. (1) A brave lady trying to protect the man she loved and dying a heroine’s death in the process. Mrs Woolcombe is buried along with her husband and others killed on the 15th. On the 17th, 16 were named in the newspapers. C.F. Anscombe (2) name was added to the list Mr A Drysdale, J. Love Montgomerie, Dr E.D. Whittle, Mr C.V. Dyson, Dr P.N. Gerrard, Mr George Wald, Mr J.B. Dunn, Mr D. McGilvray, Mr J. Harper, Mr C Smith, Mr Marshall (of Sun Insurance), Mr A. J. G. Holt (Paterson Simons), Mr Lawson, Mr B.C. Cameron, Mr Clarke (Warder) and Mr D. Legg. The caskets containing the bodies were brought to Bidadari cemetery by two lorries and a hearse. (3) The Bishop of Singapore and other clergy officiated. (4) The Strait Times published the names and more details about which section of Bidadari cemetery victims were buried in on the 18th. Included in the additional names was Senftleben, a German killed at the prison compound in Tanglin Barracks. For the regular (as opposed to the local volunteer) military dead things were a little different. They were not named until their next of kin had been notified. It was decided to hold a graveside service for them on the 3rd April. (5) Starting at 5 p.m. This was to be followed by a thanksgiving service at St Andrew’s Cathedral just for the military on the 11th. More details on the timing and order of service for the 3rd April were given in the Straits Times on the 1st April. While the procession including the firing party made its way to the graveside. On the other three sides were sailor troops from the Garrison, men from the Singapore Volunteer Corps, Wardens from the prison and Special Constables. The firing party split into two, one-half going to each side of the graves and standing in front of the men already there. Over each grave lay a Union Jack each covered in flowers. Readings were read, John chapter 9 verse 25, 26 and Job, 14 verse 25, 26, and 27. A prayer was said for the fallen, one for the relatives and mourners, and one for everyone else who was there. A lesson was then read, followed by the apostle’s creed and the hymn “On the resurrection morning was sung.​"
After the service, the firing party fired a volley over the graves and the last post was played. The firing party fixed bayonets and presented arms. The last post was again played and the graveside service was concluded. (6) The Straits Times for the 5th April on page 10 records that three volleys were fired and the volleys fired over the Roman Catholic graves which were in another portion of the cemetery at Bidadari sounded like an echo. (There was another report in the Straits Times the following day, 6 April, page 8. which emphasises the spiritual aspect of the service). Officialdom had not yet finished with the dead. While the Government were quite happy to pay for the military funerals. They did not feel any obligation to pay for the funerals of the civilians killed in the mutiny and individual bills for the cost of the burials were sent to the employers or the executors of each of the civilian dead. The government took no responsibility for civilians killed. Their attitude was that the military and volunteers were killed while on active service during the mutiny. The deaths of civilians in the same mutiny were regarded as being no different to deaths caused accidentally or old age. Officer’s relatives were also expected to pay for their funerals too. This caused more than a little resentment. (The Mutiny Victims, The Straits Times, 16 June 1916, page 9) The Singapore Free Press reported on the 17th June, page 4 that they were told that the “government is afraid of creating precedents that may lead to invisible lengths.” The Government did just that without knowing it and not in the way they expected. 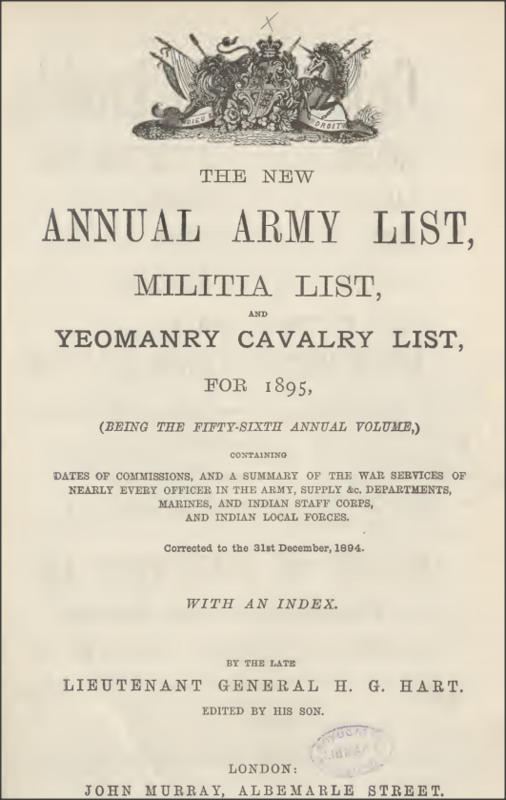 The paper replied, ” Does the Government expect an annual Mutiny as a reasonable contingency?” The argument was put forward in the same article, “that the 5th Light Infantry were the sworn servants of the Imperial Government.” The response was “The mutineers, it is granted were Government servants-but they were not carrying out their function as such when they took to lawless murder on the roads.” The Singapore Free press also asked in the same article if the mutineers were no longer government servants in the military why were they tried by court martial and executed in public as though they were? The debate continued, if not in public, at least in the papers. The Malaya Tribune on 26 June, page 4, carried an article criticising the government for its lack of responsibility for the payment of compensation due because of the mutiny. The cost of the burials was again raised in the legislative council on the 26th June. The reply was “On the 16th February owing to the confusion caused by the mutiny it was feared that some of the dead might be left unburied, and an officer was told to see that this did not occur. That officer arranged with an undertaker for the various funerals, and accepted liability on behalf of the government for the expenses incurred. When these expenses had been settled, letters were sent to five firms in the following terms…” The letters were telling the firms that Mr X…worked for them and would they pay the bill for their funeral. The council also said that if the relatives were unwilling to pay for the funerals, all the dead civilians would end up with was a pauper’s burial. Peter blogs at The Great War (1914-18). ​The ruins of St Fitticks church lie at a place called Nigg Bay on the south-east side of Aberdeen in a boggy field a stone throw from the sea. It is not a pleasant ruin to look at by any stretch of the imagination. It is down a gentle slope from the coastal road that takes you round the cliffs to where I live. I drive by it every day and like most of the local populace, I don’t visit it although to do so would be easy as there is a layby on the road beside it. It is an uninviting ruin surrounded on three sides by a chest high wall and on the remaining side by a six foot wire mesh fence. This encloses a graveyard smattered with broken, toppled or sunken headstones, the majority of lead lettering stripped off years ago and taken to the local scrap metal merchants. The church building itself has no roof and the walls have basically been splashed with concrete to keep them standing, it now resembles a garage extension to a house and any vestige of how it looked previously has died under the layers of cement which is a shame as St Fitticks church is believed to date from the 1100s and the present building (under all the concrete) dates from the late 1600s. To get into the grounds you enter through the rusting gate on which the Commonwealth War Graves Commission sign has been snapped in two. In the east corner is the old watch house presumably staffed before 1832 (prior to the passing of the Anatomy Act) as a deterrent to would be body snatchers. It could well do with being staffed again to keep out the alcoholics and feral children who inhabit the grounds these days shouting insults at each other and throwing beer cans from behind the cover of broken gravestones. I suppose this is one of the main factors dissuading anyone from venturing into its small grounds alongside the weather, as it is usually getting battered by the North Sea winds! Being an inquisitive soul, I have visited, and despite being such a small site, the stories it has told me have enriched me which is a perfect example of the benefits and rewards of actually paying attention, interacting and learning about your surroundings and not just driving by them every day. The West Scotland: Remembrance, Commemoration and Education site (www.westscotlandrce.co.uk) actually inspired me to write this piece and share some of the stories, despite me being on the wrong side of Scotland. ​To even the most untrained eye you can tell it resembles a later addition to the original structure. Within its walls is one family plot with a large headstone. 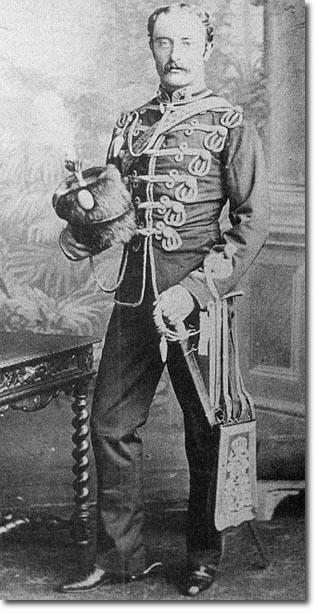 I had never heard of Colonel Davidson and was oblivious to any military actions that the 8th Kings Royal Irish Hussars had been involved in during his lifetime. And more puzzling, why was he buried here in 1932 when the church was believed to have been in a poor state of repair and unused as far back as the mid 1800s when its congregation moved to a new church less than a mile away. I turned to Google for inspiration and sure enough I was able to piece this man’s life together from a few different online sources. I didn’t have the time or inclination to attempt to investigate primary source evidence so the fact that I got my questions answered online made me a happy fellow. In the late 1700s, the land that St Fitticks Church stood on was owned by the Davidsons, a wealthy family. It was part of the Balnagask Estate and was inherited by James Davidson. 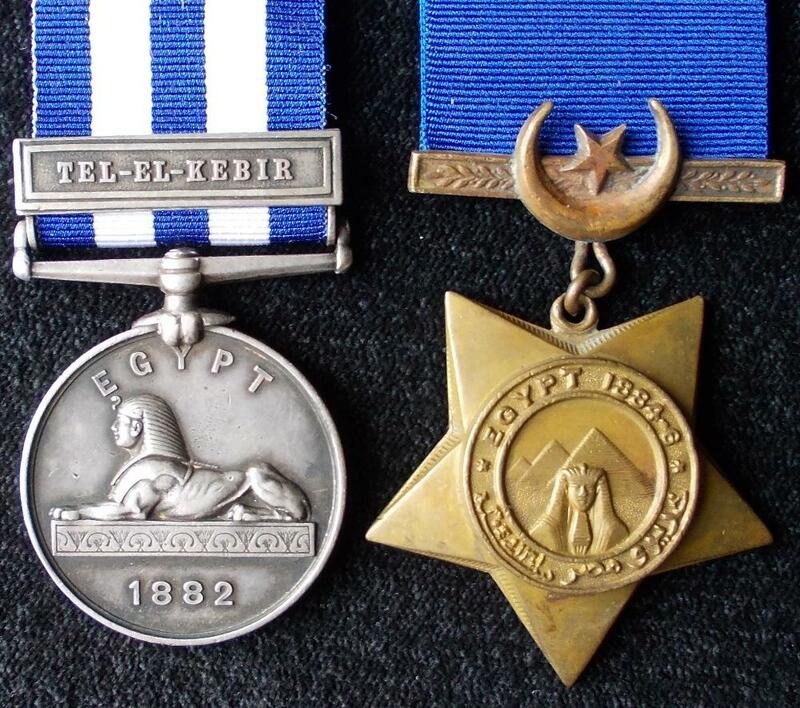 In 1882 Captain James Davidson took part in the Battles of Kassassin and Tel-el Kebir in Egypt attached to the 13th Bengal Lancers. The battle of Tel-el Kebir was particularly famous as it was the only night charge ever carried out by British Cavalry. In fact, the story of that alone is quite interesting and I have linked to an article I sourced from The National Archives in Kew. 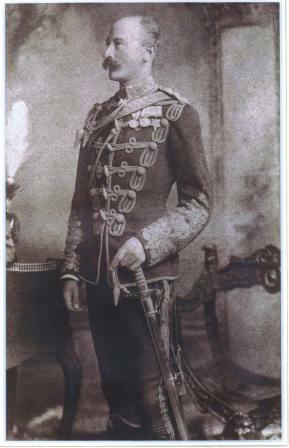 In this picture of him from 1896, he is wearing his uniform as Colonel 8th Kings Royal Irish Hussars. You can clearly make out the Khedives Star Medal. Colonel Davidson died in 1932 at the age of 79. His funeral was held at St Andrews Cathedral on King Street in Aberdeen and he was buried at the church on his own estate with a plot added to the exterior wall due to the lack of space within. He now shares this plot with his wife who died in 1940 and their son who died in 1949. I believe the city council now own all the land previously belonging to the Davidson family (but this I am just surmising). It is a shame this man who eventually ended up serving as a Staff Officer to Lt. Gen Sir Garnet Wolesley lies at rest in a dilapidated little church yard on the outskirts of Aberdeen that has clearly seen better days. It also illustrates how the history that is all around us can enrich our lives. It only takes a keen eye and an inquisitive mind to paint the landscape a different colour. How can I drive past the dilapidated church yard ever again without giving a nod to our Colonel? 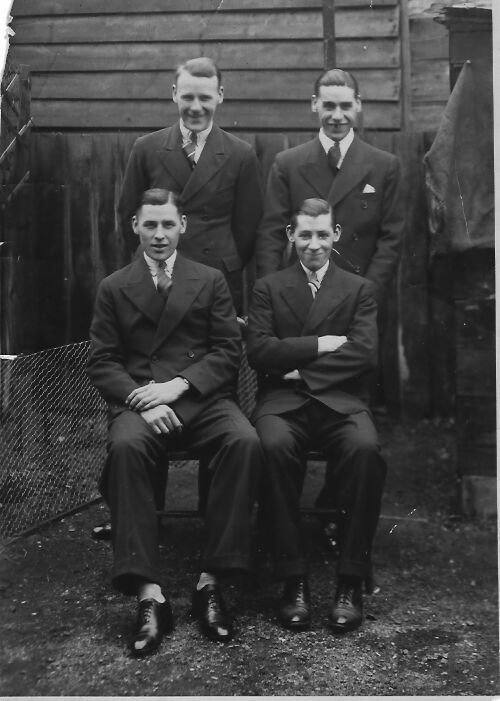 My grandparents and their four sons (one of whom was my dad John) lived in Atheldene Road in Wandsworth at the start of WW1. My grandfather Thomas had been a Royal Marine for 12 years, leaving in 1905 to marry Emily Potter. Emily was born on February 2nd 1877 in Lambeth, London. She was born into a poor family and her father’s occupation was described variously as general labourer, green grocer, costermonger and hawker of fish at different points in time. After leaving the Marines, he worked at Nine Elms and Clapham Junction and had just been promoted to a signal man in 1914, his pay increasing to 26/- a week. ​Things were on the up. However, as a member of the Royal Marine Reserve Brigade, Thomas was quickly called up and sent to France. He took part in the defence of Antwerp during which, he went out on patrol and was shot in the head. He survived and was brought back to England but died on his 40th birthday on October 20th 1914. Tragically, Thomas would never have been called up had he not been in the reserve; he was too old. ​Shortly after Thomas had died, Emily received a letter that Thomas had written whilst in hospital. Receiving the letter must have been particularly heartbreaking as Thomas had written that he believed he would soon be transferred nearer to home. I also have a copy of the letter of condolence written by his CO, surely the first of many he would go on to write. He had served with Thomas before the war, knew him well and said “he was the finest of many good men, was brave under fire and generally played the game” – this is touching – Thomas was indeed a keen sportsman and this comment is so very “Edwardian” and of its time. ​​The family were so poor that when I tried to find his grave in the 1990s, I discovered that there was no headstone. 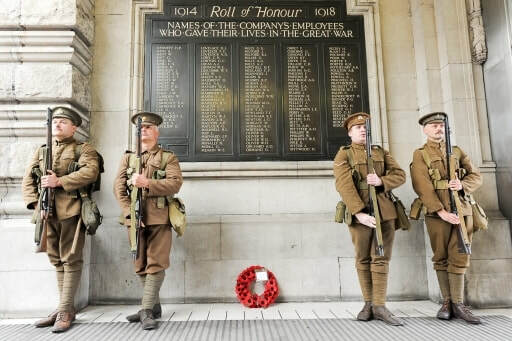 I contacted the Commonwealth War Grave Commission, who arranged for a headstone to be made and erected on his grave – I was so thrilled that he at last had his own memorial – he is remembered on a memorial at Waterloo Station along with other colleagues who worked for the same rail company and who also perished in the war. ​The year following Thomas’s death must have been a terrible struggle. On the first anniversary of his death – 20 October 1915, 100 years ago, Emily was looking after their four sons, the eldest of whom was 8, the youngest 5. She took a job in a laundry and set about raising her sons as a single mother, a daunting prospect for any woman in 1914 with no welfare state or National Health Service for support. She would work in the laundry by day and briefly return home to feed her boys before going back out to scrub floors by night. Emily’s frantic schedule meant that she would often put the boys to bed in their school uniforms as she would not be there to prepare them for school. ​​I find the thought of her day to day struggles unutterably sad. Thomas was a really loving husband and father – you can see this in his postcards and letters to his wife and boys; he had been on the way up in his employment with the railway and Emily had such a wonderful future to look forward with him. He had even bought the boys musical instruments to play as he wanted them to get as much culture as possible. All that changed. The instruments were sold. The lads had to work as well when possible – though one son – James –got a scholarship to Emmanuel College in London. How did she manage it?! The four boys were devoted and looked after her when they were young men. They all played a lot of sport, read and got on as best they could. They were all a credit to her, having families, doing well in relatively low paid, but secure jobs – sadly James died at El Alamein, a fact that was kept from Emily just before she died. ​There were no medals or citations for Emily but she was a truly wonderful, remarkable, uneducated but lovely lady. Thank you to the grandmother I never met, but whose hard work helped me become who I am today and of whom I am indescribably proud. ​Deborah blogs at Historical Musings. ​'The reader’s eyeballs prick with tears between the bath and pre-lunch beers' . ‘War Photographer’ by Carol Ann Duffy. I think it is always difficult to truly associate ourselves with anything that does not directly impact us. As humans we are capable of feeling a certain amount of sympathy and empathy for a person/situation. It is also true that these feelings will vary depending on our relationship with the affected person and, perhaps, our own narcissistic tendencies. However, I think that this empathy is often passive; are we really just thankful that this distress isn't directly impacting us? Wars influence us daily. These wars can be with another person, a situation or ourselves. As humans we often have conflicts arising from situations out with our control and we battle through them in order to live the happiest life we can. How often do we really think about the horrifying situations in Aleppo and the suffering of the people? Does it take a photograph in the newspaper or a retweet on Twitter to gain our sympathy, or does it just make us give a sigh of relief that it isn't us? A hundred agonies in black and white from which his editor will pick out five or six, for Sunday's supplement. The media is always looking for what will shock the reader most. There will be thousands of moments in the war where lives are lost and soldiers are helplessly powerful as their enemy drops a weapon and they still hold their gun. But we don't see these moments: unless we really think about it. We see moments that will make us gasp in horror. Moments where children are crying as they are covered in dust and blood whilst 'running in a nightmare heat.' We question how this can be allowed to happen and how wrong it is, but we are also subconsciously relieved that it isn't happening on our doorstep. We will take a moment to look at the devastating photos - if we have time. ​We want to relate to situations and we want to feel a deep sadness for the misfortunes of others. Yet, we live in a world where it is so easy to cover our eyes and think about our own issues and priorities. In ‘War Photographer’, Carol Ann Duffy highlights this issue: an issue that is both human and political. A War Photographer experiences first-hand the horrors of brutal conflict. It changes him as a person when he is back in his darkened room reflecting on the horrific experience. He does his job when he is there but trembles at the memories. This is something which is not passive to him, he can put on a mask for his occupation but he has witnessed the devastation. Unlike the readers of the newspapers who glance, shake their heads and continue on. History shares with us many wars with different outcomes, but in the end a 'leader' screeches their victory as the blinds are closed on the devastation humans created. We glance for a moment and then choose to look away. The loss of innocent lives is normalised as war is viewed as a solution with never-ending problems. However, the loss of lives has happened. It isn't fiction, but we can be guilty of treating it as if it is. We choose to be indifferent because we can: emotional investment is only a priority when it has to be. Leanne Welsh is an English Teacher. Leanne's blog page can be accessed here.